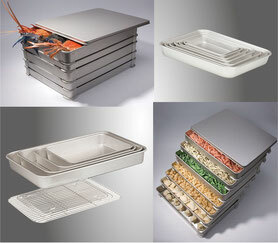 With portable series, we suggest making use of the characteristics of aluminum "heat conductivity" and "lightness" to manufacturers.The product we recommend is an aluminum trays(Batter tray / oven pans/ container).To meet the needs in various situations, 216 on ready-made items are available. 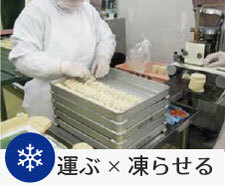 Our products have been accepted for many years, especially in the food industry, with the same quality of 1-yen coin manufacturing.In recent years, our products are widely used in the Japanese manufacturing scene, and many ideas are coming in from everyone for ways to use our product as portable containers or trays etc. Aluminum demonstrates its value in severe temperature change.Heat conductivity is very good, 13 times as high as stainless steels, 575 times as high as polyethylene. Therefore, it can capture and transfer external temperature to the contents quickly when heating or cooling, etc. Aluminum is a very light metal, it is about one-third of the weight of iron or stainless steel. This series has been a success in work places with many females and in work places with a lot of loading and unloading. Aluminum products have less breaking or cracking, compared with resin products.Also, since the smell related to the transition of metal does not occur, you can put in the contents directly. Therefore, you do not need to put sheets or bags in your container, and can reduce the risk of contamination. A single container can be used in any process repeatedly, work efficiency will increase. The way of temperature change varies depending on the manufacturing process.So we introduce it in 4 patterns. You can bake food on the same pan after preparing.Smooth work without replacing equipment. Alminum thermal conductivity is 13 times as high as that of stainless steel. 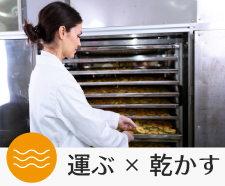 Drying efficiency will be improved ! 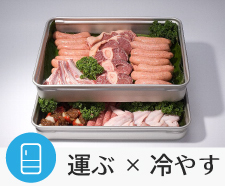 You can use the tray which is used for cooking or preserving for carrying. We introduce the pan and tray that matches your manufacturing process perfectly from our items. Also we produce your original items together considering the situations and requests.Please do not hesitate to contact us.